Thank you for visiting the Joe R. Adair Outdoor Education Reservation site. The Adair Center is open to all public schools in Laurens Districts 55 and 56. Teachers will be able to select from a variety of lessons, each lasting from an hour to an all-day Problem Based Learning Investigation. If more than one class is in attendance, the expectation will be for a teacher to lead a class while the Director leads the other. Curriculum materials are available if needed, including team building games, scavenger hunts, and self-guided tours. Additionally, there are hikes, a rope swing, and games for break times. Tour of old Pioneer Cabin? 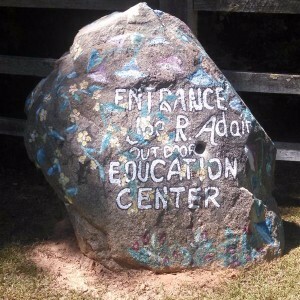 Located at 110 Scout Creek Court, The Joe R. Adair Outdoor Education Center opened on March 22, 1996. Since that time, thousands of students and their teachers have experienced "hands on" education at the Center. Nestled in a wooded area off Parkview Drive behind Collyar Park in Laurens, the site for the Joe R. Adair Outdoor Education Center features 8.24 acres of mature hardwoods, colorful wild flora, and a winding creek. American beech, yellow poplar, and a hodgepodge of other hardwood trees and vegetation flourish in this habitat, as Scout Creek meanders through a ridge of varying elevations to create a moist and fertile bottomland. The property, given to the Soil Conservation District in 1992 as a gift by retired Soil Conservation Service employee Joe Adair, also includes an office and classroom building, an amphitheater, nature trails, picnic area, and a Native American area. In addition, an authentic Laurens County log cabin, which dates back to the 1800's, was donated and carefully relocated to the Center property. The log cabin site features a pioneer setting, including a garden. 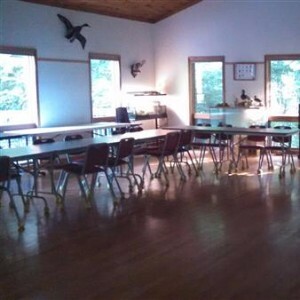 The purpose of the Joe R. Adair Outdoor Education Center is to serve as a learning center for children and adults in Laurens County. Instruction at the Center focuses on the natural sciences and soil and water conservation. Design and construct the fastest rolling vehicle in which the entire vehicle is able to fit within a frame with the inside dimensions of 15 x 20 cm. The front of your car must be the 15 cm side. Your car will not fit on the ramp if made with the 20 cm as the front. The maximum height of the vehicle is 10 cm. The vehicle will race down an incline plane with inside track dimensions of 16 cm wide and 145 cm long. The winner of each heat will advance to the net level of vehicle competition. The competition will continue until a champion is determined. Design and construct a vehicle in which the entire vehicle is able to fit within a frame with the inside dimensions of 15 x 20 cm. The front of your car must be the 15 cm side. Your car will not fit on the ramp if made with the 20 cm as the front. The maximum height of the vehicle is 10 cm. The vehicle will race down an incline plane with inside track dimensions of 16 cm wide and 145 cm long. All teams will be given the opportunity to race a vehicle one time for maximum distance. A distance champion will be determined by the vehicle that travels the greatest distance from the starting point before coming to a complete stop. (A different vehicle may be used for each task). · Teams may consist of no more than four students. · Each teacher may submit one team per class to compete in the speed challenge. · Each teacher may submit one team per class to compete in the distance challenge. · Each vehicle must be brought in a shoebox with the team name clearly labeled on the outside of the box and on the vehicle. · The same team can compete in both challenges. · Once a team turns in a vehicle, no changes may be made the day of competition. · Students may not fix their vehicles at the challenge line. · Vehicles should be placed in a box and brought to the competition. The box should have the student’s names and teacher name clearly visible. · Students should place their teacher’s name on the vehicle. · Be sure your entire vehicle fits down into the frame which is 15 cm x 20 cm; therefore it is recommended that the vehicle be 14 cm x 19 cm or smaller. · If the vehicle does not fit into the frame it will be disqualified. · Making the frame as even as possible, being sure the corners are very clean is the key to getting the car to run in a straight line. · It is suggested that students mark the front of the car so they know which way to place the car on the ramp. · No weights can be added to the vehicle. Design and construct the fastest wind-powered rolling vehicle that will fit within the 15 x 20 cm frame. The race will cover a distance of approximately 6 meters. The winner of each heat will advance to the next level of vehicle competition. The competition will continue until a champion is determined. All teams will be given an opportunity to race their vehicle one time for maximum distance. A distance champion will be determined by the vehicle that travels the greatest distance within the marked boundaries from the starting point before coming to a complete stop. · Sails may be of any size. · It is suggested that students mark the front of the car so they know which way to place the vehicle. Design and construct the fastest rolling vehicle in which the entire vehicle is able to fit within a frame with the inside dimensions of 15 x 20 cm. The front of your car must be the 15 cm side. Your car will not fit on the ramp if made with the 20 cm as the front. The maximum height of the vehicle is 10 cm. The design must be able to hold a 500g (1.1 Pound) weight within or on the frame of the vehicle. The weight is about 6.5 CM tall and 4 CM wide. The weight cannot be attached to the vehicle; it must sit freely on or in the vehicle. If the weight falls off the vehicle during the event, your vehicle is disqualified. The vehicle will race down an incline plane with inside track dimensions of 16 cm wide and 145 cm long. The winner of each heat will advance to the net level of vehicle competition. The competition will continue until a champion is determined. Design and construct a vehicle in which the entire vehicle is able to fit within a frame with the inside dimensions of 15 x 20 cm. The front of your car must be the 15 cm side. Your car will not fit on the ramp if made with the 20 cm as the front. The maximum height of the vehicle is 10 cm. The design must be able to hold a 500g (1.1 Pound) weight within or on the frame of the vehicle. The weight is about 6.5 CM tall and 4 CM wide. The weight cannot be attached to the vehicle; it must sit freely on or in the vehicle. If the weight falls off the vehicle during the event, your vehicle is disqualified. The vehicle will race down an incline plane with inside track dimensions of 16 cm wide and 145 cm long. All teams will be given the opportunity to race a vehicle one time for maximum distance. A distance champion will be determined by the vehicle that travels the greatest distance from the starting point before coming to a complete stop. (A different vehicle may be used for each task). Teams may consist of no more than four students. Each teacher may submit one team per class to compete in the speed challenge. Each teacher may submit one team per class to compete in the distance challenge. Each vehicle must be brought in a shoebox with the team name clearly labeled on the outside of the box and on the vehicle. The same team can compete in both challenges. Once a team turns in a vehicle, no changes may be made the day of competition. Students may not fix their vehicles at the challenge line. Vehicles should be placed in a box and brought to the competition. The box should have the student’s names and teacher name clearly visible. Students should place their teacher’s name on the vehicle. Be sure your entire vehicle fits down into the frame which is 15 cm x 20 cm; therefore, it is recommended that the vehicle be 14 cm x 19 cm or smaller. If the vehicle does not fit into the frame it will be disqualified. Making the frame as even as possible, being sure the corners are very clean is the key to getting the car to run in a straight line. It is suggested that students mark the front of the car so they know which way to place the car on the ramp. No weights can be added to the vehicle. The 500g weight will be added during the competition. No additional weights (i.e. quarters, washers, or any other non-frame materials) can be added to the vehicle during the build. Design and construct a catapult that will toss a ping pong ball into targets approximately 4 meters away. Targets will consist of two containers: a summer pool (approximately 22 cm in height and 1.12 meters diameter). The front edge of the summer pool is 4 meters from the firing line. The smaller container will be placed in the middle of the larger container. Each team will be given 5 tosses. A ping pong ball landing and staying in the large container will score 10 points, a ball landing and staying in the smaller container will score 25 points. A ping pong ball hitting the bucket and bouncing out of the pool area will still score 10 points. The team with the highest total points is champion. Each team will be given the opportunity to toss one ping pong ball for the distance challenge. The champion for distance will be determined by the team who ping pong ball travels the greatest distance from the launching area. Measurement will be from the launching are to the point where the ping pong ball strikes the floor. · Each teacher may submit one team per class to compete in the accuracy challenge. · Each catapult must be brought in a shoebox with the team name clearly labeled on the outside of the box and on the catapult. The box will be put along the wall of the gym until the team is called to compete. · The same team can compete in both accuracy and distance challenges. · Once a team turns in a catapult, no changes may be made the day of competition. · Students may not fix their catapults at the challenge line or in the stands. · Catapults should be placed in a box and brought to the competition. The box should have the student’s names and teacher name clearly visible. · Students should place their teacher’s name on the catapult. · The ping pong ball must stay in the basket on its own. 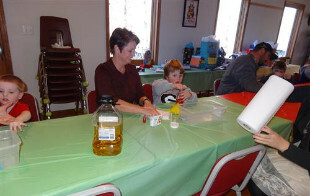 · Only glue can be used to hold the catapult together. Tape, nails or screws will result is disqualification. · Throwing arm cannot exceed 40 cm. · The basket can be made of wood, poster paper or a combination of both. · Students must construct the entire catapult from scale drawings. · Rubbers bands must be less than 1.5 cm in width. Rent the Joe Adair Center for Birthdays, Meetings, Training, and much more! Joe Adair Center can not be used for private or corporate gain! Must be a non-profit community organization. a. Students will look at all the animals of the Adair Center. We will talk about their basic needs for living for younger groups and the animal’s adaptations for older groups. We will pet/hold/feed many of the animals. a. Students will build a 2D paper bird from many choices of beaks, feet, heads, and tails. Students will have to also make a habitat for their bird to live in. Students must include a safe place, water, and food in their bird’s habitat. a. Students will be a bird for this game. They will use 3 different types of beaks to “hunt” with. Students will have 30-45 seconds each round and they must determine what type of beak works best for each type of food source. a. A relaxing but education walk on our Nature Trails. We will stop and talk about plants and animals as we see them on the trails. a. Students will have their own scavenger hunt paper while on the trails. They must look for different types of plants, animals, food sources, water sources, plant and animal defenses, and many more! a. Students will take a walk on our nature trails while looking for examples of weathering, erosion, and deposition. Students must describe what they see and also draw an example. a. 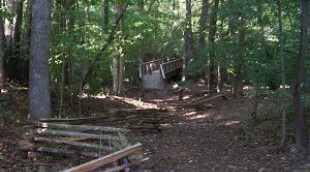 Students will walk on the nature trails while writing what they see, smell, taste, hear, and feel while on the trails. a. Students will dissect an owl pellet. Students will separate the bones of the prey animals of the owl onto a bone chart. a. Students will create a Chia head with soil, seed, water, and light. They will be allowed to take their projects home to watch their seeds grow into plants. a. Students will color and cut out two live cycle sheets. They will create a frog life cycle flip book and a colorful butterfly life cycle matching paper. a. Students will take part of a walk through rock cycle game. There will be 10 stations around the room with spinning wheels at each station. Students will spin the wheel and walk through the rock cycles as told where do go by the spinners. a. Students will get a box of metamorphic, sedimentary, and igneous rocks to look at. We will look at them up close with hand lens and describe their properties of each type. a. Students will look at premade jars of soil mixes. We will shake the jars up and look at them in one hour and see how they settled. In between looking at the jars, we will use soil sifters to separate sand, silt, and clay. a. Students will be given a conductivity tester to use during this lab. Students will be allowed to test different objects to see if they are insulators or conductors. a. Students will look at different slides under the microscope. Students will be able to look at different types of plant and animal cells and draw what they observe. a. I will bring a tub of random things in it. I will pass out items and students will have to come up with one quantitative and one qualitative statement for each item. I will ask students to share their observations if time allows. Best done in small group setting. a. Experiment where we take a penny and count how many drops of water will fit on the penny. We then change from just normal water to water with soap in it and see if that changes our data. 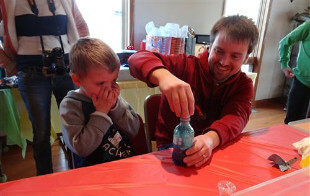 It is a good experiment for teaching the scientific method. Each student will be provided a penny and water dropper to use during experiment. a. I will bring a tub of different instruments used in science (Digital Scales, balance scales, triple beam balance, thermometers, hand lens, and others). The students will have to make observations of the room, items, or other things using their science instruments. Best done in small group setting. a. Students will each have a magnet and they will move around the room testing different objects. a. Students will get a mixture of sand, bens, metal, and corn. The students must use the materials provided to separate the mixture. a. Students will make animals using Playdoh. a. Students can read books about plants, animals, and many other topics from our hundreds of book choices. a. Students will tour the old pioneer cabin. Students will look at the different tools used to build the cabin and different items in the cabin. a. Students will make a mold and cast fossil using modeling clay and plaster. They will need to take them home/back to school and let them dry for a day. a. Students will play a jumping game to show them how natural selection works in animal populations. a. Students will play a game to show how animals depend on food, water, shelter, and space and what happens if one or more resources run out. 27) How big is our Solar System? a. Students will color a paper cut out of a planet. After all planets are colored, we will go outside and walk off a scale model of our solar system. We will also show how all the planets move in orbit around the sun. a. Students will have to create an animal off of 100% chance using dice. After they get all their information, they must draw their animal in their habitat with their food sources. a. Students will apply their understanding of those concepts as they construct and test their roller coaster. Through a cycle of building, testing, observing and revision, students will gain an experiential understanding of fundamental physics concepts and the basics of successful roller coaster construction. Students will also have an unstructured opportunity to hone teambuilding skills as they communicate with their peers during roller coaster construction. a. If teacher wishes, we will go outside and make Smores and swing on our rope swing during our lunch hour.